As these bath melts fizz under running water, they will release the avocado and tucuma butters to moisturize and soften your skin. INCI Ingredient Label: Baking Soda, Citric Acid, Tucuma Butter, Avocado Butter, Kaolin, Fragrance, Red 40 Lake. To make entire 48 bath melts, recipe will need to be repeated four times. Place silicone mold on cookie sheet to keep sturdy. To a glass bowl, add 1 cup of Baking Soda (8 oz.) and 1/2 cup (4 oz.) of Citric Acid. Mix with a wire whisk and break up any clumps with a fork or use a sifter. Add 1 teaspoon White Kaolin Clay and 1/8 teaspoon of the Bath Powder Red color. Mix well until ingredients are well incorporated. This powder dye may speckle a bit. CAUTION: Too much color can stain bathtub so we recommend using the specified amount. Set powder aside. To microwave-safe mixing bowl, add 4 oz. Tucuma Butter. Heat in microwave for 1 minute. Once melted, add 4 oz. of Avocado Butter and let the heat from the first butter melt the Avocado Butter. If necessary, heat for additional 20 seconds. Add 3 ml of fragrance to the melted butters. Before adding powder mixture to butters, drop a teaspoon of powder mixture into the butters. If it starts to fizz, the butters are too hot. Let cool a little more before adding the entire mixture. Add powders to melted butters and quickly mix with a wire whisk. Immediately start to pour into mold. After filling 3 or 4 cavities, stir with whisk to keep mixture blended. Continue in this manner until all the cavities are filled. Place cookie sheet with mold into freezer for about 15 minutes. This will prevent any fizzing that may occur. 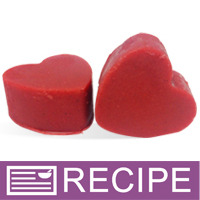 Remove bath melts from mold and place on waxed paper. If left in freezer too long, hearts will sweat. Leave out overnight and they will be fine the next day. REPEAT Steps 2-11 to make next batch, if desired. Packaging Suggestions: Place 3 bath melts in clear cello bag. Fold any excess under bath melts and place in white window box. Label product accordingly. Be sure to add warning to label that product will make tub slippery. To Use: Place 1-2 melts under running water. Be sure to use a bathtub mat as this product can make tub slippery. NOTE: This product will be slightly soft. The Tucuma Butter combined with the Avocado Butter helps keep the product harder. If making this during the summer months, a butter with a higher melt point, such as cocoa butter, can be a good substitute for the butters. "Should you add Poly 20 so the product can emulsify in the water? " Staff Answer You would actually want to use Polysorbate 80 to emulsify these bath melts into the water. It is not necessary to add but may help keep the mica from sticking to the sides of the tub. "Can I make this without the fragrance oil? Will the melted butters be enough or do I need to add another liquid if I don't use a fragrance oil or eo? The Acai butter gives them a nice color. Is there another natural color I could add to this recipe? The red color you used is Red 40 and my grandson is very allergic to that dye. " Staff Answer Because it is only 3 ml of fragrance in this recipe you should be able to eliminate it without much of a change to your final product. We still suggest testing a small batch with the adjusted ingredients. Although you will not get the same color in your product you can try our Crimson Sparkle Mica Powder which only contains Mica Powder and Iron Oxides. "I don't have a heart mold, do you think i can pour this into a sheet and use a cookie cutter. Of course it would have to be a thick enough sheet." Staff Answer Hi Tracy, that's a way we have never tried before. You would have to test that and see if it works for you. I would recommend to try it out in a small batch. "What can I substitute for the butters?" Staff Answer You can substitute any butter with a similar texture for the butters in this recipe. We do recommend testing substitutions in smaller batches. You will also need to adjust your ingredient label to reflect any changes to our original recipe. "Can you leave out the baking soda and citric acid for non fizzy bath melt and they still wotk fine?" Staff Answer Yes you can. Just be sure to adjust your ingredient label to reflect any changes you make. Your butters will still melt and you will have a nice creamy water, however, part of the neat thing about using the other ingredients is to make it fizz. Also, the fizzzing disperses the butters. "I have acai butter but I was informed not to heat that particular butter due to the fact that all the benefial properties of the fruit will be removed from it???? " Staff Answer Our directions for this recipe instruct users to allow the heat from the melted Tucuma Butter to melt the acai butter. 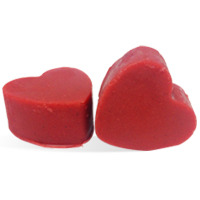 This low heat will not affect the beneficial properties of the acai butter blend. "Do these bath melts fizz as they melt?" "Is it really 25 pounds of Kaolin Clay?" Staff Answer I know it is hard to see but the recipe actually only calls for 0.25lb od kaolin clay.